Terrapins, members of the tortoise order, are similar in appearance to many of the most common types of turtles. Best known of the North Carolina terrapins are the diamondbacks (Malaclemys terrapin), which breed in marshy areas near the seacoast and were once a minor, though lucrative, part of the state's commercial fishing industry. Diamondback terrapin soup, made with sherry and a thick cream sauce, was considered a delicacy in northern cities before the Civil War. The first recorded commercial terrapin catch in North Carolina occurred in February 1849, when the keeper of the Bodie Island lighthouse, using a specially designed dredge, caught 2,150 diamondbacks that he sold in Norfolk, Va., for $400. By 1880 the total marketed yield in the state was 123,000 pounds, but thereafter the terrapin fishery declined, with only occasional catches reported after World War II. By the early 2000s, diamondbacks were threatened sufficiently by net fishermen and coastal development to be categorized as a "species of special concern." At the same time, the unique coloring and design on their shells has resulted in their being sought mainly by herpetologists and hobbyists. R. E. Coker, The Natural History and Cultivation of the Diamond-back Terrapin (1906). "Hardluck Terrapin," Wildlife in North Carolina 64 (February 2000). 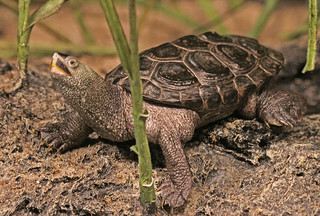 "Diamondback East Coast Terrapin at the North Carolina Acquarium, Fort Fisher, NC., 110623. Malaclemys terrapin", 2011. Image courtesy of Flickr user Jerry Oldenettel. Available from http://www.flickr.com/photos/jroldenettel/5883025850/ (accessed July 25, 2012).